Copywriter | Portfolio | Marketing Brochures . I prepared this brochure copy for a company providing corporate and private event solutions. The design of the brochure was straightforward: double-sided A4, folded into three, giving six distinct pages. This presented some writing challenges. The company had a lot to say, with limited space, so I had to choose ways of describing their services in as succinct a way as possible. Potential clients both in the private and corporate sector with responsibility for managing events. From wedding planners to office party organisers to conference managers. Big corporate meeting coming up? Sales Conference to run? End-of-year party on the horizon? And everyone’s looking at you to run everything? You’ve got a limited amount of time and have to stick to a budget. It’s a big responsibility and you’ll look great if it goes well, but where do you start? Surprise party? Planning a wedding? You probably want everyone to have a fantastic time and wouldn’t mind enjoying it yourself! But how? Who do you call? What do you ask them? We’ll take care of it. 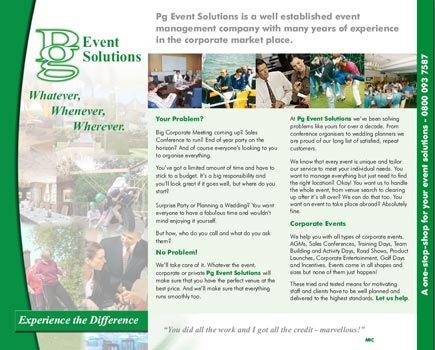 Whatever the event, corporate or private, Pg Event Solutions will make sure you have the perfect venue at the best price. And we’ll make sure everything runs smoothly, too.